When a kimono is selected for re-interpretation as modern attire, it is unwrapped from its rice paper or acid-free transparent packaging, and immediately inspected for spots, tears or damage. The vast majority of kimono come protected by traditional herbal treatments, used to eliminate insect damage during long storage in the semi-tropical climates in parts of Japan. At SuMoNo, we leave the herbal treatments in place until we are ready to work with the item, so they remain protected in their storage at our studio. Studio staff carefully unpick all the stitching that holds the garment together, and remove the hundreds of small pieces of cut threads. The unpicking takes several hours by an experienced hand. Seeing what we've got & deciding what to make! Once unpicked, the drape of the individual cloth reveals itself more fully. At that point we decide how to best highlight the movement of the cloth and the placement of the pattern in the finished garment. 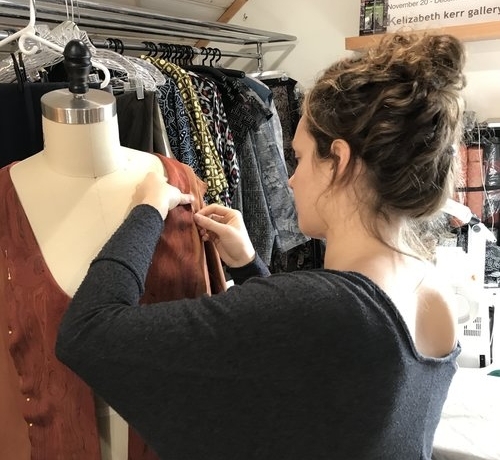 For some garments, I personally drape the fabric on one of several dress forms and mark and pin the garment seams for staff to construct the final piece. Transparent cutting templates are laid out along the full yardage of the fabric to evaluate pattern-matching across seams. Once we are satisfied, staff use roller-cutters to cut the individual segments for the chosen garment. Segments destined to become rainwear are re-inspected, ironed, de-linted, and carefully rolled up onto a hollow core to prepare it for laminating. This process takes at least an hour per garment, of very focused attention. We then mount the roll of fabric onto a special housing we designed and added to an industrial heat press. 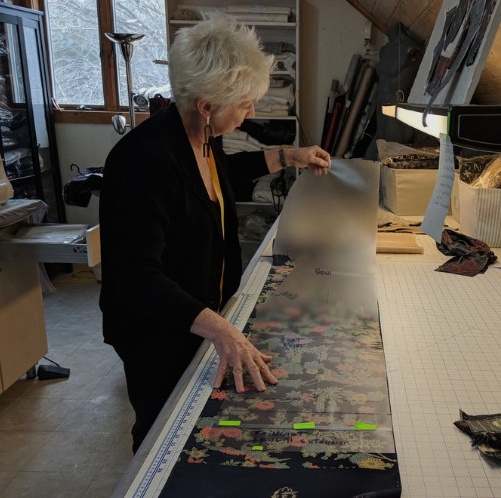 The fabric is laid on the laminating bed, and the clear film is then laid carefully over it, ensuring that there are no wrinkles or stray threads and that the fabric itself is laid accurately on-grain. The heat and pressure of the press fuses the laminate and fabric together, which must then be allowed to cool on the bed before the roll is ready to be advanced for the next section to be pressed. Once a kimono is selected, it is then treated in our in-house ozone chamber. Ozone chambers are a state-of-the-art technology for neutralizing any organic vapors and sterilizing the fabric. Ozone is even used for hospital linen, so it is extremely effective and safe for the fabric. 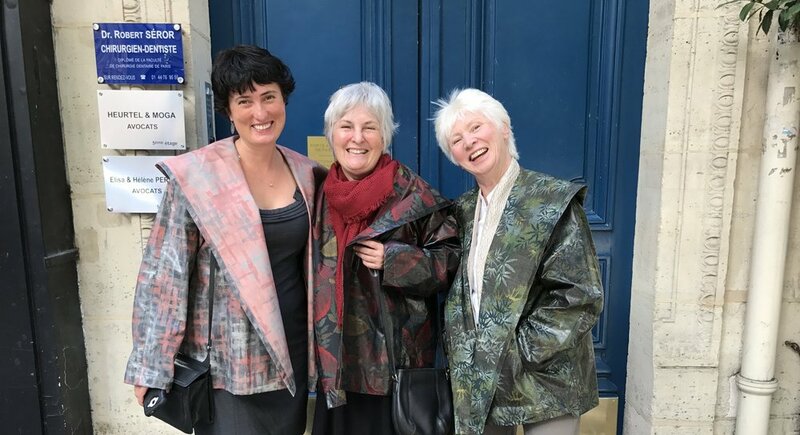 For a kimono to work as a featherweight hooded raincoat, both sides of the fabric must be beautiful since the ‘wrong’ side shows, forming the striking lapels that drape toward the back hood. Only fabric done in Kasuri (Ikat) technique, jacquard weave or rice paste resist dyeing are suitable. The silk is inherently lightweight, and the laminating film is only 3mm thick, with no additional facings or linings, which makes for the lightest of all possible garments — ideal for travel, packing, and effortless wear. Segments destined to become rainwear are re-inspected, ironed, de-linted, and carefully rolled up onto a hollow core to prepare it for laminating. This process takes at least an hour per garment, of very focused attention. 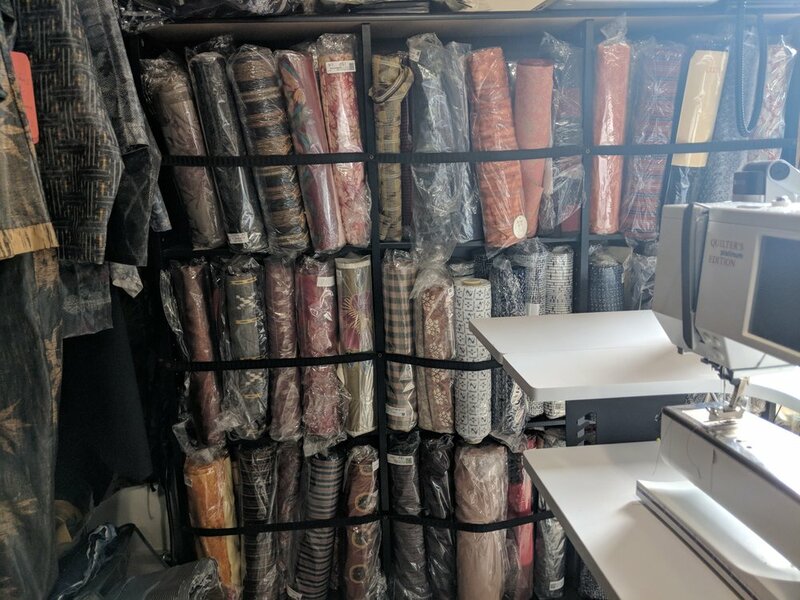 Sewing for our rainwear is accomplished off-site, in small batches, using commercial machines that are required to handle the sewing of the laminate. Each type of fabric responds differently to the laminate. The lightest, smoothest textiles take on a patent-leather-like quality, while the crêpe “chirimen” retain a matte or satin finish. In some cases, the colors are intensified by the laminating process — like wetting a beach pebble. Each of our pieces is one-of-a-kind, and gives new life to a vintage garment that was designed, enjoyed, and preciously cared for in its earlier life. We delight in presenting these rejuvenated textiles in cuts to suit a contemporary lifestyle.